There is the interesting idea of getting a tattoo that is invisible under ordinary light. But when the tattooed area goes under a UV light, it comes alive! For this, there are approved ultraviolet reactive ink for tattoos. Elements that glow in the dark without help from UV light contain phosphors – a substance that glows brightly after being ‘charged’ under another source of light. Inks with phosphors have been used in tattooing. However, none of them has been approved to be used. Why? Phosphors are a known carcinogen – to make phosphors more visible and emit more light, a tiny amount of radioactive substance is added. Practice caution if you want to get one. 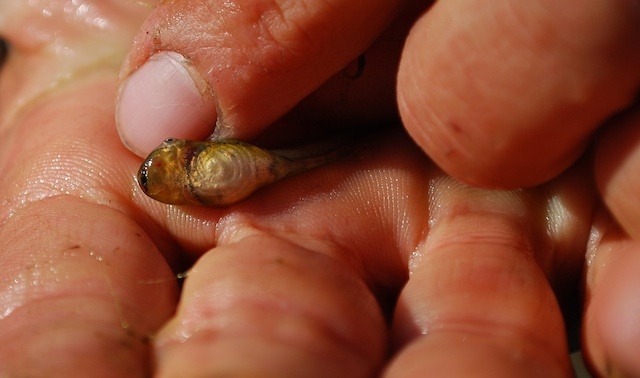 Know what type of ink that is going under your skin. For more black-light tattoos, check out these 18 Stunning Black-Light-Responsive Tattoos. To begin, one must understand how rudimentary 3D vision works. A sense of perspective can be achieved with one eye, but two parallel eyes are needed to perceive depth and relative distances in space. The two separate images perceived by the eyes are merged by the brain to form a single picture. Englishman Charles Wheatstone, discovered a way to represent three-dimensional images on a flat surface in 1838. At this same time, photography was invented almost simultaneously in France and England. 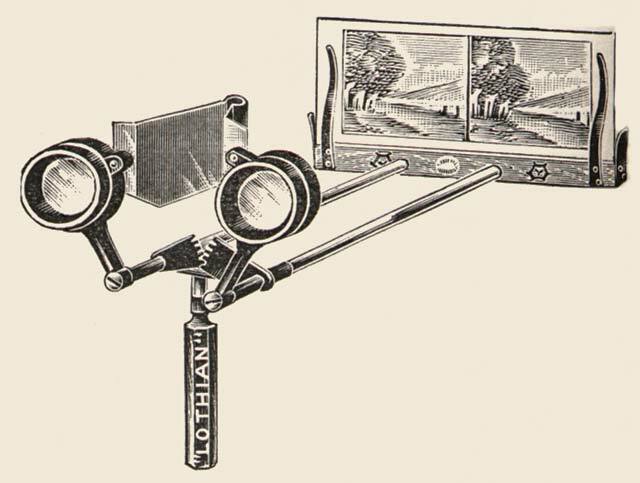 With the discovery that stereoscopy is possible, ‘Stereoscopes’ or viewing equipment, were started to be created with two viewing lenses, each to look at two separate, but same, photographs. Anaglyph comes from two Greek words, “anagluphos”, which means “wrought in low relief” and the word “anagluphein”, which means “to carve in relief”. 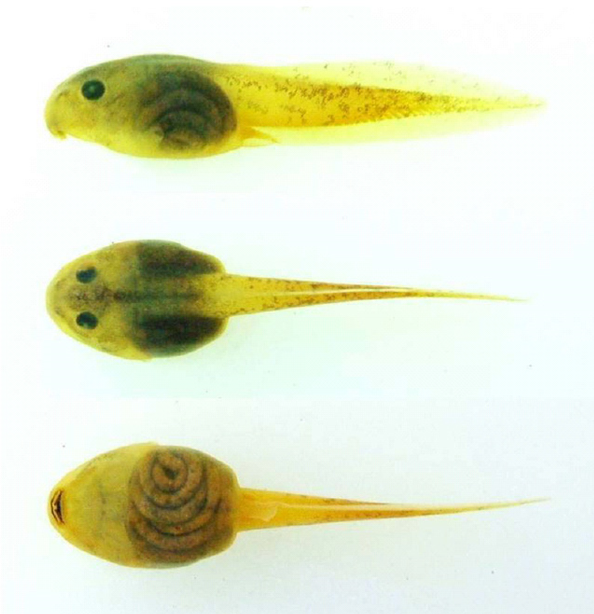 This process was pioneered in 1850 by two Frenchmen, Joseph D’Almeida and Louis Du Hauron. 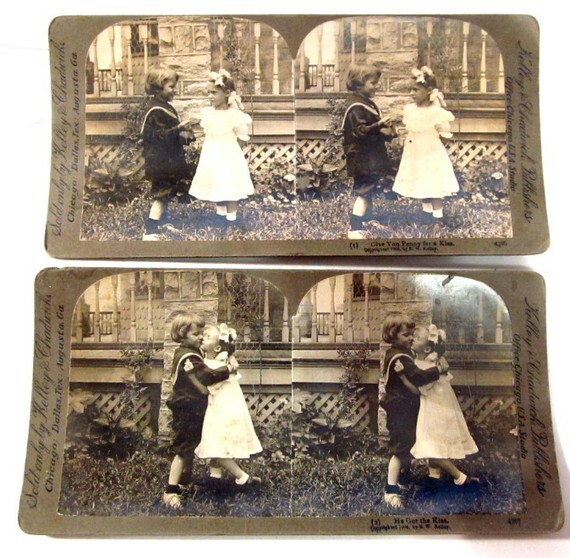 They created images where red and blue filters were used for color separation, and the viewer had to wear red and blue glasses to view the image with the intended effect: stereoscopic imagery – pictures with the illusion of depth. A novel way of wearing tattoos will be getting it done in anaglyph 3D. The call for admiration of the tattoo workmanship more than makes up for the extra action of putting on 3D glasses to view it in a proper context. 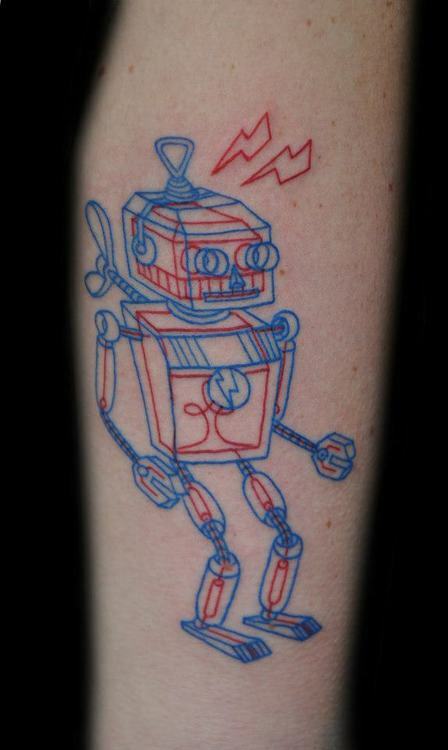 A quick search on the internet brought up only a few examples of 3D tattoos. 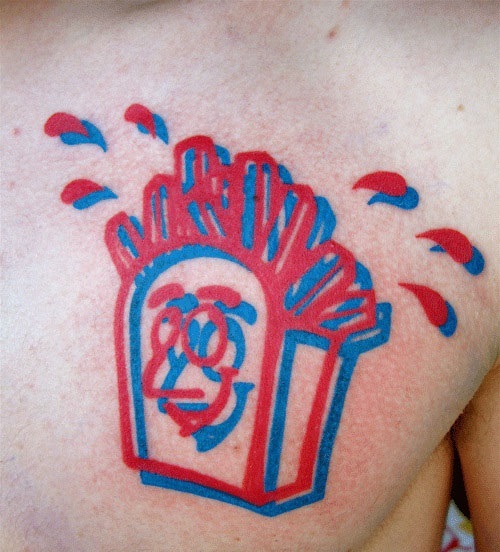 This shows that there is potential for expansion of this quirky tattoo idea. Left) Courtesy of Joker the Tattoo Shop, Finland. Tattoo by Tuula Joka. (Right) Courtesy of Lost Highway Tattoo, Belgium. This Kayan design is traditionally observed to be tattooed onto the wrists of Kayan men and women but adapted by other tribes to be tattooed onto shoulders and throats of men. An extreme modification of the Kayan Aso tattoo. 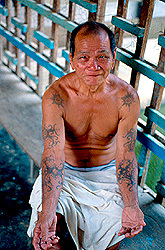 Tattooed on the shoulders of many Borneo warriors, two rosette motifs can be found, one on each shoulder. 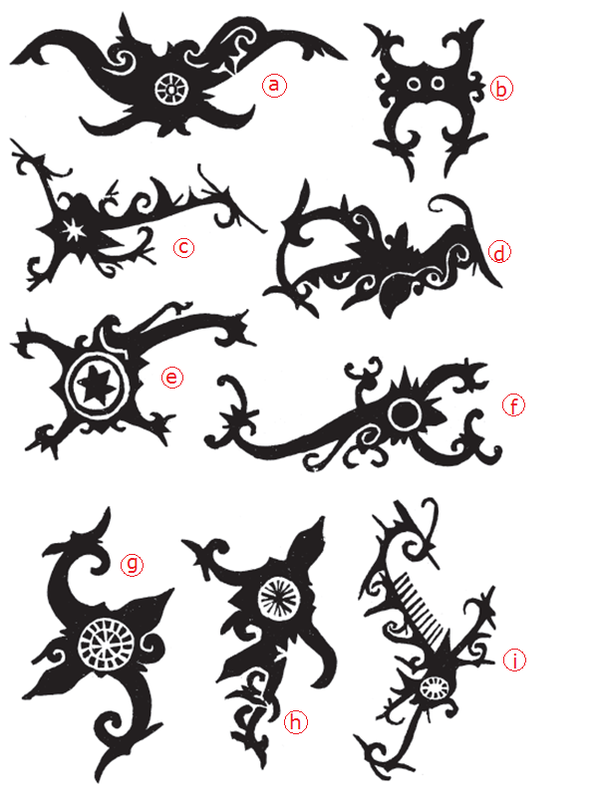 At the time this was written, reliable sources of Borneo tattoos and pagan practices could not pin point the true origins of this design. 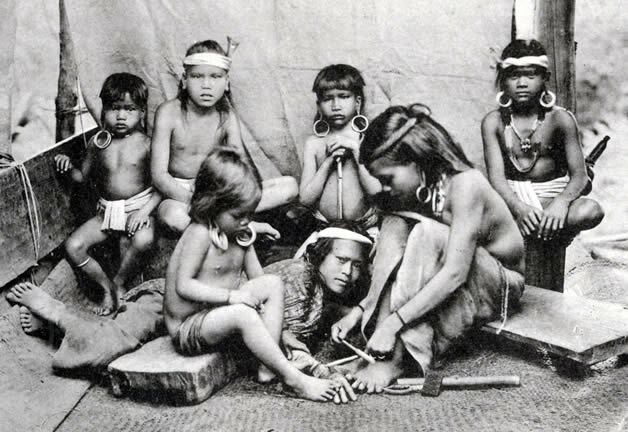 However, it is widely believed that it was a common Kayan design that spread out to other Borneo tribes, was adopted, with the meaning lost in translation. A remarkable account for this design comes from Charles Hose and R. Shelford (Materials For A Study of Tatu in Borneo, page 66). They explained that ‘Jalaut’ is most likely a new name for the ‘Mata Aso’, a stylized version of the Aso – minus the legs but with regular geometric or spiked edges. However, the Kayans in the 1900s have adopted Jalaut as the name of this design, but they have today returned to calling this design ‘Mata Aso’. c. The plukenetia plant fruit, gathered and also cultivated as a vegetable.The plant which lent its name to a degraded rosette design of the original ‘Mata Aso’. Illustration © Anita Walsmit Sachs, 2004. The ‘Ipa Olim’, according to the Kenyah and Kayan people, is a stylised rendering of the opened fruit of a wild mango (Hose.C and Shelford R, 1901). 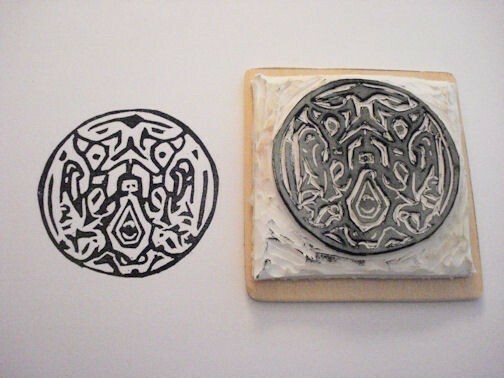 Notice the similar rosette design of the ‘Mata Aso’, but with different edges. 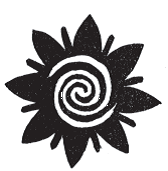 The double spiral swirl in the middle is probably a retained element of the eye of the Aso tattoo design. It is of interest to note that the mango tree species is not endemic to the Borneo jungle. This fruit is in fact brought over from India and has been cultivated successfully in the tropical regions over 6,000 years ago (Ensminger, 1994). 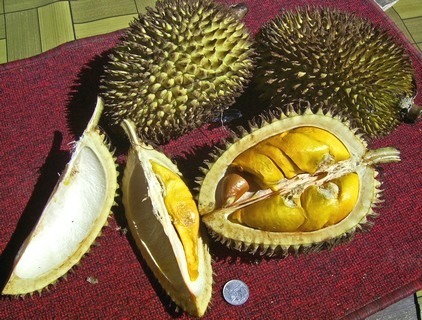 It is logical to assume that this relatively new fruit has influenced the Borneo tribes somewhat, and has evolved to the following example of design. The open mango fruit. Peeled like a banana to access the fragrant flesh inside. 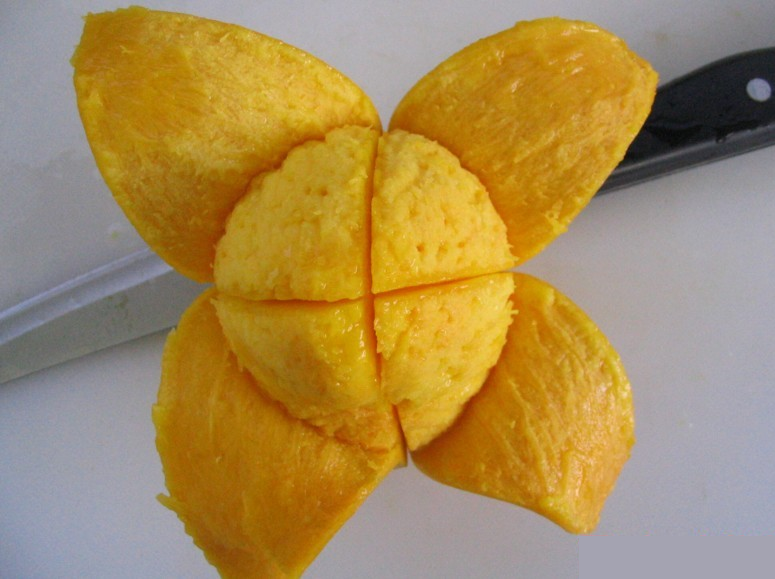 Image courtesy of Panam Properties © Richard Novey H.
The ‘Ipa Olim’, or mango flower, of the Kenyah people. 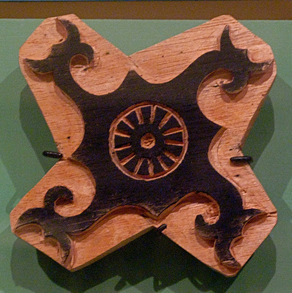 Tattoo block from the Sarawak Museum (No.1054.14). 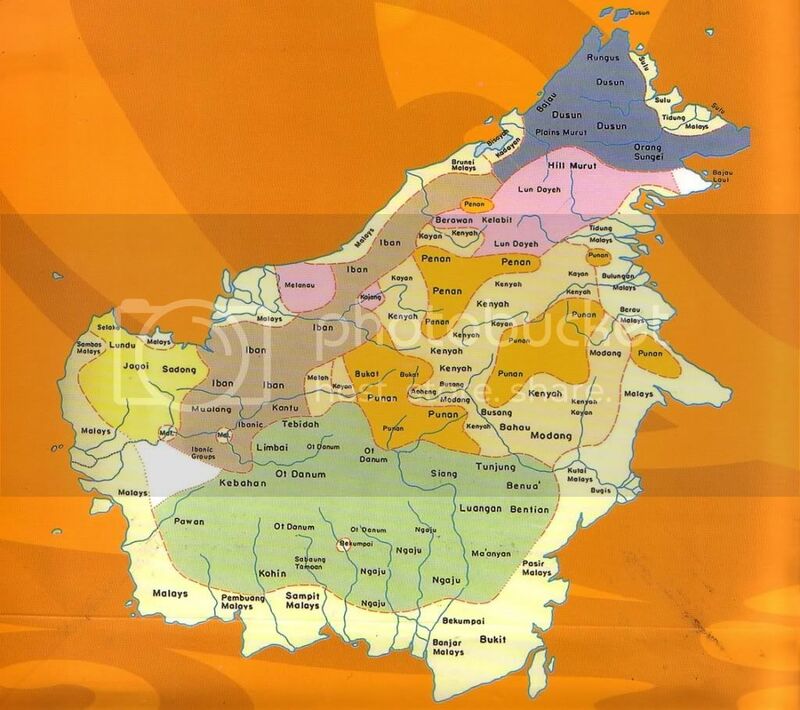 A peculiar weakness of the Borneo tribes is their love for the durian fruit, almost to the point of veneration. ‘Dusuns’, or orchards, of tropical fruits are a wealthy heritage of a village or a family. Men and women will make annual pilgrimages to collect durians, and these fruits are judged by their fragrance, softness, sweetness, colour, and succulence. It has become such a significant part of life that the Kenyah have durian rosettes tattooed on their shoulders, possibly to give them strength to bear basket straps, carrying their prized contents down from the dusuns. Kenyah ‘Usung Dian’, representation the durian . 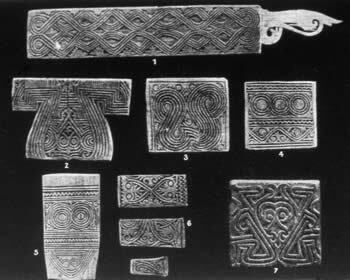 Tattoo block from the Sarawak Museum (No.1054.17). 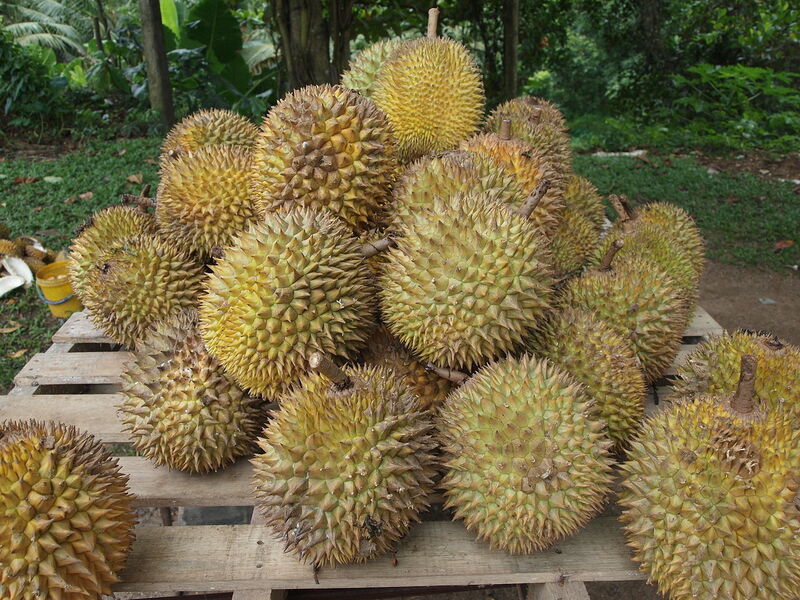 The King Of Fruits, the durian and the iconic prickly and thick outer shell. Picture from Wikipedia. The edible part of the fruit, the seeds. Picture from Wikipedia. 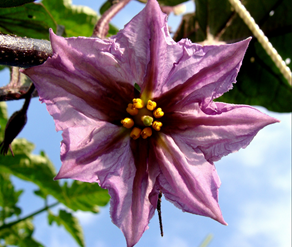 Another deviation of the Kayan Mata Aso rosette is the Bunga Terung, which translates to eggplant flower. It is one the first tattoo an Iban male would receive. The Bunga Terung is a coming of age tattoo which marks the passage of a boy into manhood, a journey called “Berjalai”. All other tattoos, following the eggplant flower, are like a diary (Krutak L. 2007). This Iban version of the Kayan rosette has a meaningful and interesting explanation, especially the significance of the double spiral in the middle. 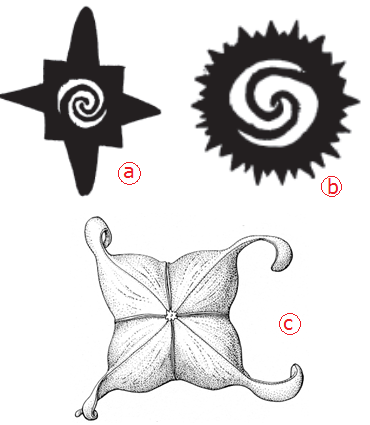 Possible influences of the Kayan ‘Aso’ design on subsequent rosette designs of the Kenyah and Iban.